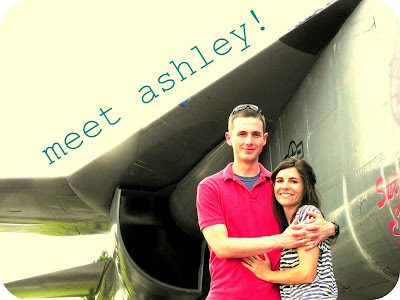 Ashley is a friend from A&M that runs My Little Sunshine - a fabric shop and also runs a handmade shop too! She has all kinds of loot in there that is to.die.for. However, you know I'm a sucker for fabric, so that's what I get to brag on today. My Little Sunshine Fabric has some of the best selection out there of gorgeous designer fabrics -- at the BEST prices. I could go on and on about Ashley and her amazing shop, but I'll let her take over from here and tell you her heart behind her shop. My Little Sunshine Fabric started as the dream of a crafter [yours truly] who couldn't seem to get her hands on enough fabric & was able to bud into a full fledged plan & eventually, reality with the help & support of my husband & my grandmother, Sunshine. My Little Sunshine was created to be a vibrant shop with fabrics that are hand selected for superior design & quality that make your heart pitter-patter. It has been an outlet for me to share with others the beautiful textiles & designers that make my sewing so much brighter! In it's inception, I also really wanted it to be more than just about fabric. That's where Heartline comes in. Year around, 15% of the profit from My Little Sunshine goes to support Heartline Ministries in Haiti & their women's sewing program! So when you shop with us, you are not only purchasing stinkin' cute fabric, you are equipping other women with the means to start their own crafty businesses! 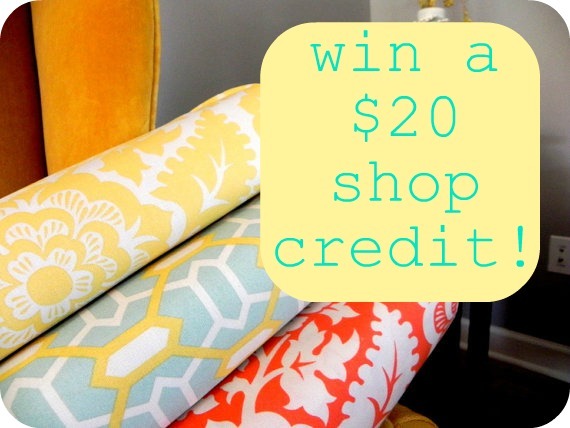 Today, Ashley is giving all of you a chance to win a $20 shop credit to her shop! 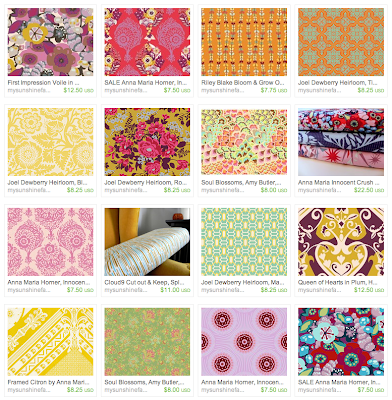 Head on over to My Little Sunshine fabric shop and tell me your favorite fabric (if you can pick one!!). My FAVORITE if I have to choose one is... the Joel Dewberry Heirloom! Oh my word! So precious! Thanks for sharing, I love love LOVE fabric! One of my faves right now is the Joel Deberry Heirloom! It would match the nursery which would be great. Doing the rest of the nursery in his Aviary 2 Granite collection! I follow you both on twitter & adore you both! I am a follower via GFC for Yellow Songbird! I also follow My Little Sunshine via GFC! Now that I came back over here I can't remember the name of my favorite, but it's the one on the second page with the birds, in orange and brownish. but I really love them all! My favorite (which was not easy to pick) is the riley bloom and grow... i'm loving orange right now!! Oh, man that Joel Dewberry Aviary 2 Scrollwork in Caramel fabric is so cute! I die! That would make the cutest throw pillow covers! Oh and I've been a YS follower for a long time and I LOVE IT! My Little Sunshine's newest follower! I love love love the Riley Blake Rainy Days & Mondays, Green Umbrellas! And I just tweeted about the giveaway! thanks for giving us this chance to win awesome fabric! Love the Joel Dewberry Heirloom in Rose Bouquet! LOVE LOVE LOVE the Soul Blossoms, Amy Butler, Peacock Feathers in Blush . I follow you both on twitter! Yay for a new twitter friend! I sent out the tweet. I really love the Cloud Nine Fabric! I follow My Little Sunshine by GFC! I love the Riley Blake Rainy Days & Mondays, Green Umbrellas, so much fun! I'm one of your happy followers! I love Cloud9 Cut out & Keep, Hydrangea fabric! I also follow My Little Sunshine via GFC. If I have to choose a favorite, it's the Riley Blake Bloom and Grow in orange. I love it's simplicity! and i'm a MLS follower! Hmm... 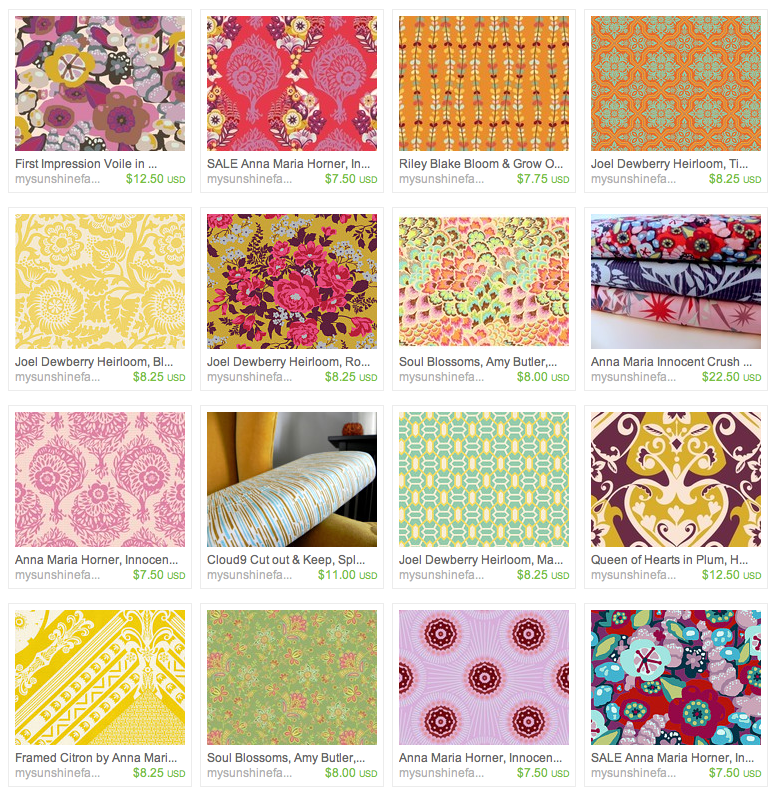 I think my favorite is the Anna Maria Horner Innocent Crush print! It's a tough choice though! I follow you and Ashley on twitter! I love the cloud 9 fabric! fantastic! great fabric! love it all! I'm already following Yellow Songbird with GFC. I follow My Little Sunshine with GFC. i LOVE the Anna Maria Horner, Innocent Crush fabric. Just beautiful. how do you choose??? IF i had to I would pick Joel Dewberry Heirloom. I just love it! Love Soul Blossoms, Citron, and Queen of Hearts! My favorite is the Joel Deberry Heirloom! I follow you both on Twitter @Craftaholic101! 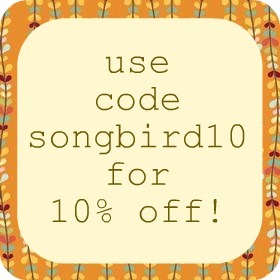 I follow Yellow Songbird blog via GFC! I really like the Joel Dewberry Heirloom Tile Flourish in Amber...perfect for my next curtain project! Thanks! 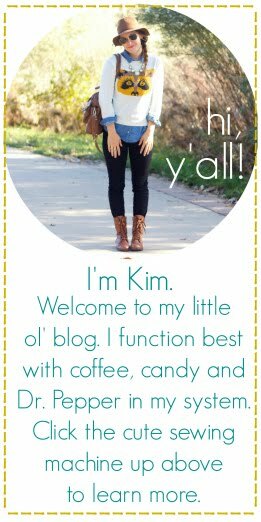 I am a new follower coming over from Faith Blogs! I signed up with GFC! I really like the umbrellas in "Rainy Days and Mondays" by Riley Blake. I'm now a follower of My Little Sunshine on GFC. I follow both on Twitter via profile @hueisei. I am following Yellow Songbird via Google Friend Connect! I am following My Little Sunshine uses Google Friend Connect. i love the framed citron by AMH! i follow y'all on twitter! LOVE LOVE LOVE Joel Dewberry Heirloom, Rose Bouquet in Gold!!!!!!!!!!!! I follow both of you on twitter!! so hard to pick one!! I love the ty pennington waves!